At what point is a reward ticket not a reward anymore? Most of you are probably familiar with the British Airways Visa card which offers a 100,000 mile sign-up bonus. I’ve convinced my dad and brother to sign up for the card as well, so when all is said and done we should have 300,000 miles in our household account, plus any miles from spending. A cool benefit of the card is that if you spend $30,000 on the card in a calendar year you earn a companion certificate whereby someone can fly with you for free. In other words, it’s a “two for one” on a first class British Airways award. 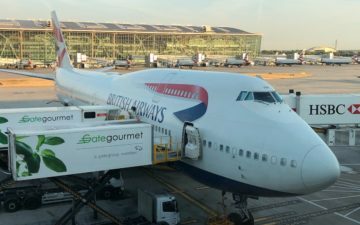 In theory that sounds nice, as I’ve always wanted to fly British Airways first class and that certificate (along with the ridiculous sign-up bonus) ease the pain of paying 200,000+ miles for a first class award ticket. But here’s what really stings — the “taxes, fees, charges, and surcharges.” On an award ticket from Los Angeles to Delhi via London Heathrow (I’d love to visit India, so realistically this is an award I’d be looking at), the cost comes out to about $900 per ticket. Now, that’s still a great deal given that this is first class, but seriously, $900 for an award ticket?! And with two people traveling that’s $1,800 (still have to pay taxes on companion ticket). This is where my mileage whoring ways start to kick in. For $900 I could probably buy a coach seat and earn another 30,000-40,000 miles for the trip, not to mention plenty of elite qualifying miles. So the only other practical option, the way I see it, is to use the miles for a partner award ticket and forget about the companion certificate. Apparently you don’t pay the ridiculous “fuel surcharges” for partner awards, so maybe it’s time to visit South America in a premium cabin on American or LAN? As it is I hate not earning miles on award tickets, but when I paid $40 total in taxes and am flying one of the top airlines in the world you won’t find me complaining. But if I’m spending $900…. I don’t plan on using my BA miles for actual BA awards…I’ll use them for awards on partners that don’t charge all these nasty fees. Sure it would be nice but for me BA First Class is not worth the extra money that the ‘award’ would cost. It’s a bit odd but I was having the exact thoughts this morning. Was trying to use BA miles for a CW award from NYC-LON, the taxes and fees are $560. A bit too high for my taste. Granted CW is nice, but I can get a prem econ seat for ~1400 and still earn more miles. Good suggestion on using BA miles on partners, maybe to Australia on Qantas? I’ll probably use my 100k miles for a business class ticket on Cathay Pacific. Either way you spend $900, one way you sit in Club World, the other way you earn 10k EQM (except not on the dAArkside) and perhaps 20k RDM. I know which way I’m going. I thought there was something about not being able to use BA miles on partners going US to Europe… not true hopefully? Hmm…now you’ve got me wondering about speding $30,000 on this card. I really want to try BA first, but maybe it’ll end up being with AA miles via Canada or Mexico. Any other creative ideas on how to get in BA first cheaply? Upon further consideration, I still think it’s a great deal to use the BOGO and pay the taxes. It’s basically buying miles at a heavily reduced price. I refer you to your earlier post about the US legacies being mileage plans with an airline attached. BA does actually sell premium tickets and, to be honest, those of us who pay for them are quite happy that they aren’t given away. Indeed, the chance to use miles to fly First on vacation, even if I have to pay taxes equal to an economy ticket, is a big selling point of BA for a lot of us. @ Christian — You can’t fly AA between the US and Europe on a BA award ticket. @ Mark — Or you spend much less and do a business or first class award ticket on a partner airline. @ Gene — I agree it’s still a great deal in absolute terms, but at the same time I have look at the opportunity cost (business class tickets to South America that are cheap). I still haven’t decided. I’ll likely still book a BA F award, as I really want to try them. Here’s what’s kind of annoying for me — our one transatlantic flight out of TPA is on BA and I’ve always wanted to fly it, but it’s sold as a two cabin flight and goes into LGW. If I were to take advantage of the BA award I’d probably book a separate ticket to LAX and start from there to “maximize” the experience. If only the TPA-LGW flight were sold as a three cabin! @ Rory — You’re absolutely right, but I’m used to US FFPs. More power to BA if they can get away with this. I’m thinking about spending $30K for the BOGO. My question is, since most of us get the card so late in the year, will the spending in Dec 09 carries over to 2010 or will the clock restarts Jan 1st, 2010 for a new calendar year? @ imm2b — My understanding is that it’s based on calendar year spend, so the clock would reset on January 1. If I recall India has some of the highest departure taxes for Biz/First class tickets. So that would be another good reason. @Lucky- actually, I called Chase last week, and among other topics of discussion was the calendar year v/s year from when you got the card. According to the Chase CSR, the 30K spend clock starts when the account is opened, not on a calendar year basis. @ echohorn — I was told the same when I called, but I just don’t trust them. The T&C’s online clearly state calendar year, so I don’t want to “waste” too much additional spend with them this year if it’s a gamble. I always trust what I read in writing over what a CSR says. With regards to Chase credit cards, the one year timeline is defined as an actual calendar year from January 1 to December 31. If a rep tells you otherwise, you are being given incorrect information. This is NOT a rolling calendar year like Hilton HHonors used to have. So those planning to spend 30K on the BA card would be wise to wait until January 1. Thanks for the info guys. I definitely will wait after the Jan 1st to spend the 30K. BTW, with the impending BA strike and them losing 1000 pounds/minute, wondering how much longer BA will stay solvent. Unfortunately no matter what you do they are going to get you. At the fees alone you are almost paying for your ticket (not in first class of coarse). This reminds me of the time I went to a “time share” sales pitch where they were going to give me an all expense paid vacation. The catch was, the fees and taxes were going to cost as much as the trip. The sugar coating is not so sweet once you get through the frosting.